The Systems Modeling Language (SysML) specifies a rich set of modeling constructs to represent text-based requirements as elements that can be related to other elements in a model. Model Based Engineering has become important in recent years, as the complexity of systems has increased and the engineering profession has recognized the need for more sophisticated mechanisms for describing and developing these complex systems. Enterprise Architect has full support for SysML and the modeling of Requirements, including support for a range of ways of presenting Requirements such as: Diagrams, Lists, Matrices, Hierarchies and documentation. 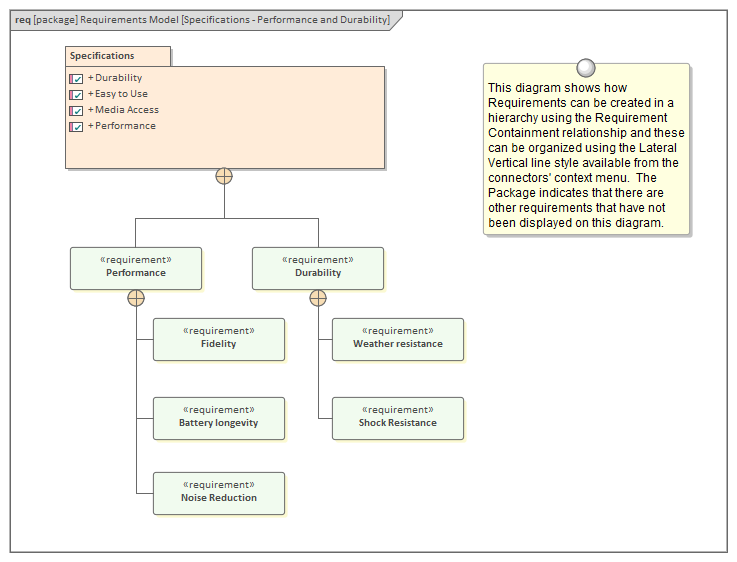 There are even dashboard diagrams that present charts and graphs that summarize requirements' properties such as Status, Priority and Difficulty in a visually compelling way.